The countdown is over. For the past week, College FootBlog has broken down college football’s 2010 Preseason Top 25. In case you missed them, take a look at teams #8-#15 and teams #16-#25. We now unveil our Preseason Super 7, along with some things to look for this fall. 1. Alabama: The Crimson Tide will likely be everyone’s #1 going into this fall, and why shouldn’t they be? They lost All-Americans at all three levels of their defense; DT Terrence Cody, linebacker Rolando McClain and cornerback Javier Arenas, but ‘Bama will reload at each position, none more that Dre Kirkpatrick at corner. The strength of the Tide, however, will be the offense. The running game will once again feature the tandem of Heisman Trophy winner Mark Ingram and ultra-talented Trent Richardson. Wide Receiver Julio Jones could be next year’s top receiver taken in the NFL Draft, and under center will be Greg McElroy, who, as opposed to last fall, has not only played on the biggest stages (see SEC Championship and BCS National Championship), but he has come through with flying colors. Put it all together, and Nick Saban appears to be in position to win it all again in 2010. 2. Ohio State: If Terrelle Pryor picks up where he left off in the Rose Bowl, look for Ohio State to challenge for a BCS National Championship this season. Pryor was inconsistent at the beginning of the season, but as the 2009 season progressed, he seemed to be more relaxed and confident, and he helped lead the Buckeyes to six straight wins to close out the season. Tailbacks Brandon Saine and Boom Herron will compliment Pryor in the backfield behind a very physical and very experienced offensive line. As is typically the case in Columbus, Jim Tressel will have a stacked defense. Although changes in the depth chart could happen after two-a-days in August, the spring depth chart for the Bucks has ten seniors starting on defense, highlighted by linebacker Brian Rolle. 3. Boise State: This fall the Broncos will not have to fight the preseason rankings like they have in year’s past. The BCS formula and bowl selection failed miserably by putting BSU against TCU in last year’s Fiesta Bowl. The Broncos return 23 of 24 starters from last year’s undefeated squad, including quarterback Kellen Moore. Chris Petersen’s team will also have a national audience for their opener at Virginia Tech. If they can win that game and take care of business for the rest of the season, pollsters will find it difficult to continue to keep them out of the BCS National Championship, especially if Ohio State or Alabama suffers a loss. 4. Virginia Tech: The Hokies will try to break the recent trend of ACC teams that are hyped up all preseason, only to fail miserably early in the season (see Clemson). The defense will break in several new starters, including the DE position vacated by E Jason Worilds, who left early for the NFL. While the youth and inexperience on defense may be an issue, this is certainly not defensive coordinator Bud Foster’s first rodeo. Look for the Va Tech defense to be solid, and they will be aided by the running game on offense. Ryan Williams blew up last season for over 1,600 yards and 21 touchdowns, and he will be joined by Darren Evans, who sat out last season with an ACL tear. Tyrod Taylor is still more dangerous with his feet than his arm, but last season, he proved he could win games by throwing the ball, too. 5. Texas: With the losses of Heisman runner-up Colt McCoy and soon-to-be first round pick Sergio Kindle, one might think the Longhorns would be in a bit of a rebuilding year, but Mack Brown is one of the best recruiters in the business, consistently replacing All-Americans with newer All-Americans. 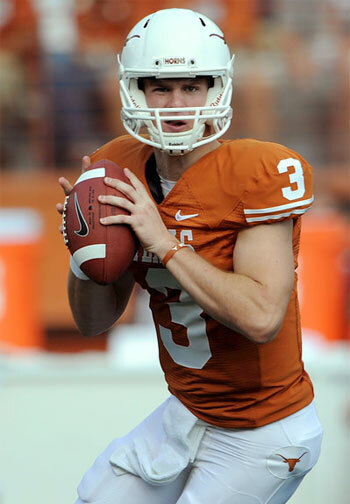 The early departure of McCoy due to injury in the BCS National Championship was a major blow to the ‘Horns chances of beating Alabama, but it provided great experience for then-freshman Garrett Gilbert. It did not take long for Gilbert to settle in, and when he did, he gave the Crimson Tide defense (which was arguably the best in the country) a run for their money. Defensive coordinator Will Muschamp once again has a talent-rich defense led by linebackers Keenan Robinson and Emmanuel Acho. 6. Oregon: Had it not been for Jeremiah Masoli’s suspension for the entire 2010 season, the Ducks would be ranked as high as #3, but when you lose a Heisman candidate, it is going to drop you at least a few spots. Head coach Chip Kelly proved last year that he can not only keep his team focused despite a suspension to a key player (i.e. LeGarrette Blount), but he can also replace talent with more talent. LaMichael James replaced Blount with seemingly no issue, as the freshman tallied just under 1,500 yards on his way to earning the Pac 10 Freshman of the Year. An off the field incident in February, however, will result in a suspension of at least one game this fall. If the Ducks can finish with one loss or less, they will have made a very strong case for a shot at the BCS title. That is because their schedule is one of the toughest in the country, and includes road games at Tennessee, Cal, USC and they cap off the season in Corvallis for the Civil War against Oregon State. Dalton accounted for over 2,700 yards passing and over 500 yards rushing. On defense, TCU loses linebacker Daryl Washington and dominant defensive end Jerry Hughs. Linebacker Tank Carder should fill the void at LB, but the Horned Frogs will need to find someone off the edge to provide pressure on opposing quarterbacks for Patterson’s defensive scheme to be effective. Patterson’s troops open up at home against Oregon State. A win against the Beavers on national television combined with their high preseason ranking could likely send them to their second-straight BCS bowl at season’s end.